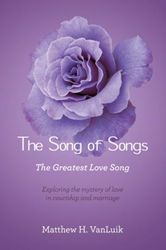 Matthew H. VanLuik’s new book, The Song of Songs - The Greatest Love Song, ($15.49, paperback, 9781498426169; $7.99, e-book, 9781498426176) powerfully evokes the passions of the heart as it explores the intimate bond of love between a man and woman. The book examines the mystery of love in this love song, to help the reader to better understand the love of God for his people. The author provides pastoral guidance to God's youth for understanding the purpose for love and marriage. He also offers encouragement to married couples to face the challenges in their relations and to grow in love for one another. This book helps readers evaluate questions such as: What am I looking for in a marriage partner? How do we as a couple develop our love during courtship? How do we build and maintain a loving relationship in marriage? How do I grow in my love for Jesus Christ as my Saviour? "I liked the book so much, I recommended it for my classroom. Over and over he makes clear also that one cannot have a truly fulfilling marriage relationship without a living relationship with Christ." Matthew H. VanLuik has served as a minister for over thirty years and is currently pastor of the Grace Canadian Reformed Church in Brampton, Ontario. He obtained his M.Div at the CRTS in Hamilton and the Th.M. in Old Testament studies at Regent College in Vancouver, B.C. Xulon Press, a division of Salem Media Group, is the world’s largest Christian self-publisher, with more than 15,000 titles published to date. Retailers may order The Song of Songs - The Greatest Love Song through Ingram Book Company and/or Spring Arbor Book Distributors. The book is available online through xulonpress.com/bookstore, amazon.com, and barnesandnoble.com.